A mass of cold air hanging over the Pacific Northwest could bring snow to the valley floor and the coast. Coming Soon! Portland's Big Bad Snowlercoaster! A rollicking ride that drops a little snow on lower elevations, drops a little rain and then drops more snow overnight. The National Weather Service said Thursday, Feb. 7, that Tuesday's snowfall was just a prelude to what could hit this weekend. A mass of cold air hanging over the Pacific Northwest through the weekend could bring snow to the Willamette Valley floor and the coast Saturday, Sunday and again Monday, Feb. 11. One forecasting model has the below-normal temperatures and wet weather hanging around for seven to 10 days, according to the weather service. 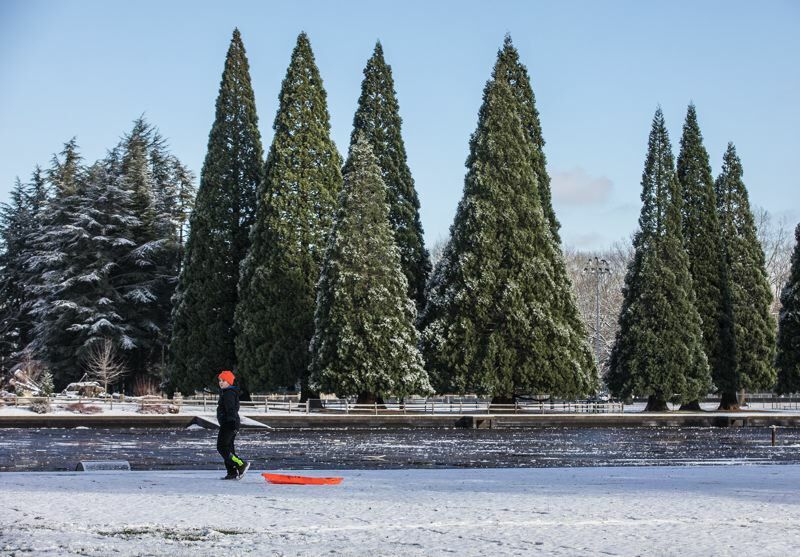 "Overall, one to three inches of snow seems like a reasonable forecast for the Willamette Valley and Interstate 5 corridor in Southwest Washington by the time precipitation tapers off Saturday night or Sunday morning," weather service forecasters wrote on their website. On Thursday afternoon, the weather service issued a winter storm watch until about 4 p.m. Friday, outlining the possibility of up to four inches of snow and a wintry mix. On Friday, Feb. 8, a band of light rain is expected to bring snow flurries to the region, but with little accumulations, according to the weather service. Rain falling Friday night and early Saturday, Feb. 9, could turn to snow in areas below 1,000 feet. That snow might stick around through Sunday, and then possibly turning to a wintry mix of rain and snow by Monday morning, according to the weather service.